Fashion Mingle CEO Melissa Shea and Media Director Patrick Hovan go backstage at Fashion Palette Australia to interview Designer Mim Harvey of Harvey the Label before her New York Fashion Week debut. Mim Harvey has brought a breath of freshness to the runways of NYFW with a collection of “social sustainability” fashion looks with many outfits having multiple ways to wear them. 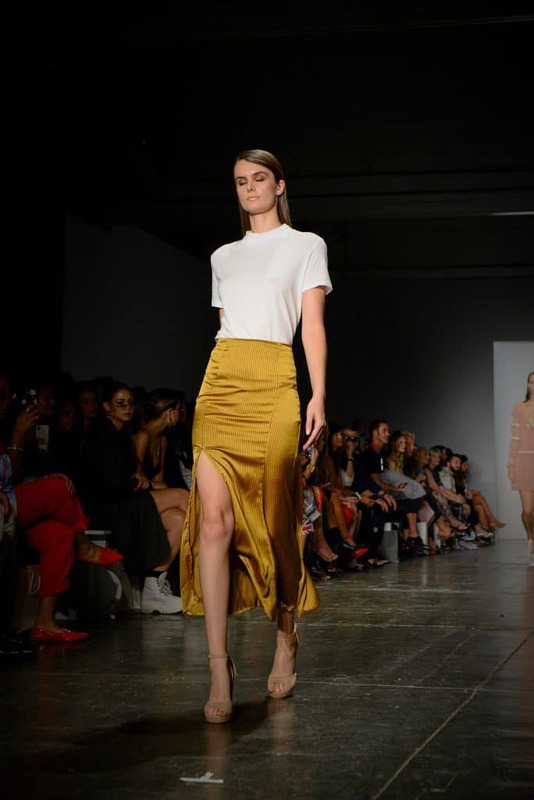 As our team gets ready take a look at an exclusive behind the scenes and backstage interview with Australian designer Mim Harvey! Backstage interview with designer Mim Harvey of Harvey The Label. Mim Harvey: This is my first collection where I’m doing embellishments. I experimented with a little bit of a new type of embellishment which is more like a fabric paint. I design my own prints and I’m always sketching new prints and finding new inspirations for things like that. Fashion Mingle: So how long have you been a designer? Mim Harvey: I’ve been designing since I was about 21. I have had my own label now for 3 years. Fashion Mingle: Tell us what’s unique about your aesthetic and your collection. Mim Harvey: The main thing that really sets my label apart is the social sustainability in the multi-way wear. So my jumpsuit that I’m currently wearing is 17 different ways to wear it. I’ve put the strap across as a bandeau, and then you can also see I’ve tucked it in at the back. They can also be worn as just pants, so later tonight I’m going to wear it as just a really cool wide leg pants, and then it can also be just like a really cute little shoulder jumpsuit. I have a YouTube channel, it’s under Harvey labels and that’s got all of our multi-way wear items. Roughly 70% of my designs are multi-way wear. I just love that my label is at an accessible price point. We’re fast fashion priced, but we are not fast fashion. We are really into our culture of reusing, rewearing, reinventing and just getting your style out of it. Girls who are a size 16 Australian, girls who are size 6 Australian, which I think is a US 4, you could both wear the exact same thing, you would just strap it different ways. Fashion Mingle: I’ve never heard of that before. That is amazing! Mim Harvey: I’ve got a 90 year old lady in 20 minutes buying the same shirt a 19 year old girl was in just wearing super low cut and strapped around. I don’t have a demographic. I like to think I have beautiful customers and they just wear everything their own way. Fashion Mingle: Where can people find your label? Are you selling online? Mim Harvey: We are selling online. We have roughly 180 stockers within Australia and New Zealand. The main purpose for us doing Fashion Week here is to expand into the US. We’ve got some really amazing buyers, agencies. We are already booked out of L.A. We are also wanting to get into some of the smaller boutique side of things and get some really cute stockers as well. HarveytheLabel.com is where you can get the entire collection. Make sure to watch out exclusive interview with Mim Harvey below!